Commercial television in the Irish Republic has begun a new chapter following the end of UTV Ireland, after just two years and eight days on air. Overnight, the last UTV Ireland programmes were played out from UTV's Belfast HQ Havelock House. At 7am Monday, the channel was replaced by be3, an offshoot channel from former rival TV3. Ahead of the changes, a number of ITV programmes previously shown on UTV Ireland have transferred to either TV3 or sister channel 3e. 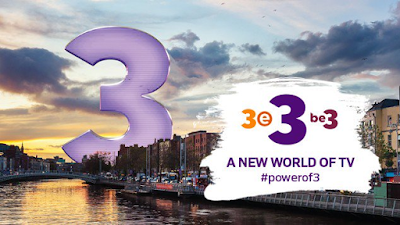 be3 becomes TV3's home of women's and children's programming, although having taken over UTV Ireland's broadcasting licence, it will also still include news in its schedule. Accompanying the changes, TV3 has revamped its on-screen look and presentation across all of its outlets. In a small country like Ireland, there was always only going to be limited scope for competing commercial broadcasters, and UTV's launch south of the border on 1st January 2015 threatened the existence of Ireland's other main commercial channel TV3, when UTV took away most rights to popular ITV shows in the Republic. But following massive losses for UTV in setting up the new channel, combined by a resurgent TV3, newly taken over by Virgin Media Ireland, UTV sold its television assets to ITV in 2016, before ITV resold UTV Ireland to TV3's owner. With the deal came the rights to show ITV programming in the Republic of Ireland, enabling TV3 to regain rights to popular soaps including Emmerdale and Coronation Street that UTV Ireland had taken two years earlier. The hole in TV3's schedule created by ITV shows moving to UTV in 2015 facilitated the launch of drama series Red Rock, which last year was also shown on BBC One Daytime. "Early on in the life of the channel, however, staff began to notice the cracks. Several spoke of decisions being made in the Belfast headquarters that showed a “disconnect” between the team there and the one in Dublin. They weren’t listening to the people on the ground who knew the market and knew what audiences wanted." "You also have to remember UTV Media PLC was a listed company – what was their end goal? Did they really want to set up a successful channel in the Republic or make the television division an attractive asset for potential buyers?" After selling its TV assets, UTV renamed itself to The Wireless Group, focusing on its radio assets. Within weeks, it was taken over by Rupert Murdoch's News UK business.